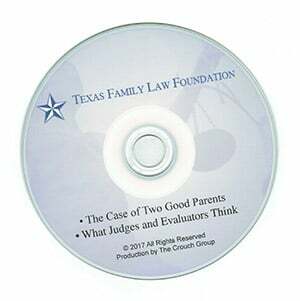 Offered exclusively by the Texas Family Law Foundation, this professionally produced video will teach you how to be more effective preparing clients for direct and cross examination, and provides valuable insights from REAL judges to a 50/50 custody recommendation. Order your copies today! Prefer to send a check? Download the order form. Questions? Contact Alison Unger at 512-476-3852 or aunger@ttla.com.